How will I get myself ready for the program? Why am I doing the program? What are my goals for the program? How do I feel about keeping a journal? What am I most looking forward to about the program? What were your wins, challenges and insights from this activity? It’s important that you do each of the activities because just reading the material isn’t enough. You need to take action immediately even if it’s only the smallest step. I want you to get into that good habit from the start. At first it will seem like those small actions don’t make any difference but over time they will add up and before you know it you’ll be closer to your dream career. Along the way there will be activities for you to complete. 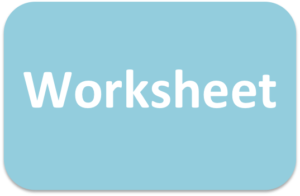 Use this worksheet to record your answers or copy and paste the questions into your electronic journal. You’ll also find some bonus activities to help you fast track your progress. Clouds in a dream are a symbol of your conscience and represent a goal you want to achieve in your waking life. It’s the same with the career dream you had when you were young. Mine was to be a flight attendant or an actor. I know, a bit clichéd but career dreams often are. A career dream is usually a specific role that you’ve fallen in love with because of the way it’s been marketed to you. It usually comes with wealth, status or fame as the main feature. They tend to be one dimensional, only considering the positive aspects of the role. It’s an idealised situation rather than a real world view of that career. Your career dream rarely includes the hard work required to achieve that role, just the end result. A dream career allows you to be the most authentic version of yourself. It offers numerous ways to achieve success. It’s not just one job title, it’s a range of options you get to choose from. That way your likelihood of success is far higher and your career can adapt as your personal circumstances change. Plus, it’s realistic when considering what your career will actually involve including the downsides. Dream careers aren’t perfect. They have their challenges but that’s part of the attraction. They’re always a work in progress and never a finished product as your dream alters over time. You can easily see how the career I ended up pursuing, professional speaker and coach, along with my passion for ballroom dancing, have allowed me to fulfill the desires that my career dream symbolised. So what was your career dream when you were young? For your first activity here are 5 important questions to help you systematically analyse that dream. 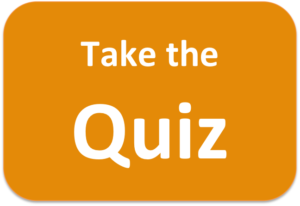 We’re going to use the answers to help you start to design your dream career. What was I actually doing in my dream? Who was I working with? How did my career dream make me feel? Why did the idea of this career excite me? You probably won’t be able to answer all these questions at once. You might need to talk to some people who knew you back then to remind you of what your dream was. Some people find it helpful to sleep on the questions and wake up having had a dream about it. You might find that your career dream was a bit vague. Career dreams tend to only focus on the good bits not the reality. That’s helpful because what you focus on can give you insights into what your career dream is really about. Your career dream is usually a sign you don’t really want to do that but something that satisfies the same desires. Now take your answers and see if you can come up with your own list of 3 to 5 key words similar to the ones I used above. In a former career as a recruiter I would spend time asking people about their past roles and was often surprised that they couldn’t see the patterns that I could. They didn’t understand why job A didn’t work out for them and then accepted job B, which came with the same issues. That’s why they were now sitting in front of me trying to get job C! They kept finding themselves in the wrong career because they weren’t clear on what they wanted. Now I appreciate that sometimes you just need a job to earn money and pay your bills but that usually wasn’t what was going on here. They just hadn’t taken the time to sit down and think about what they wanted. They just sleep walked their way into the next available role. So here are some questions to help you work out what you really want. As you answer them be 100% honest with yourself. Don’t just put an answer because it sounds good, this isn’t a job interview. Why did I choose my original career? What has been the path of my career so far? What do I like about my career path? What do I dislike about my career path? What have been the highlights of my career? What have been the low points in my career? What was the best role I’ve had? What was the worst role I’ve had? What do I wish I’d done differently in my career? What patterns can I see in my career? What have I learnt about myself from my career? What insights can I get about my dream career from this analysis? So now that you have some key words that inspired your original career and you’ve analysed your career history it’s time to look at the practicalities of your dream career. That’s because it’s easy to get carried away by how you want to feel and not consider other aspects. I’ve chosen these 5 criteria because in my experience they represent the keys to creating a dream career that is right for you. Customised A dream career isn’t a “one size fits all” career. It’s a career that’s customised to fit you. If you have to conform with a rigid set of rules then it probably isn’t a dream career. For example, in some occupations you must spend a certain amount of time in each position before being promoted regardless of your skill level or how hard you work. That is definitely not customised. Flexible A dream career shouldn’t lock you into one role or one way of working. It should have enough flexibility to allow for changes in your personal circumstances. The big one here is having children. Can you take a career break or alter your working hours to fit your needs when that happens or will it damage your career? This is relevant for men and women. Resilient It’s important your dream career is resilient enough to bounce back when things go wrong including economic downturns, legislative changes and evolving consumer tastes. Don’t fall for the trap of choosing the latest “on trend” career only to find that a few years from now demand drops off and your career disappears. Check to see if you can use that career to pivot to something else. Controllable You should have a good amount of control over your career rather than feeling as though your organisation is setting your career path. Many people find themselves pushed into leadership roles when they’d prefer to stay doing the “technical work” and have no control over this process. Longevity A dream career should be able to see you through your whole career. Some careers are too physically, mentally or emotionally demanding to be long term and others prevent you from having relationships or a social life. A high pressure role might seem appealing today but how will it feel in 5 or 10 years from now? When I think about my career dreams (Flight Attendant or Actor), it’s obvious neither of them meet all these criteria. Sure, they satisfied some of them but they didn’t align with my definition of the terms. That’s an important point: each of these terms actually mean different things to different people. That’s the great thing about a dream career: you get to choose what’s important. Later on in Session 4 on “Setting a new direction that works for you” I’ll introduce you to the different types of pivot you can do. You’ll see then how you can create a dream career that adapts over time so you can keep meeting these criteria as your needs change. Unfortunately too many people take the first definition to be the only definition. Our obsession with fame, wealth and status is causing too many of us to go into sleep mode to cope. As a result we start to hide who we really are and stop being authentic. Authentic means to be real or genuine, not copied or false. People can tell when you aren’t being authentic Whether they’re your leader, team members, peers, customers or suppliers, being inauthentic impacts their level of trust for you and without trust you can’t develop the kind of relationships you need to succeed in any career. Think about people you’ve encountered in your career and I’ll bet you can immediately pick the authentic ones from the inauthentic ones. Now think about how their level of authenticity impacts your relationship with them. You’ll find it hard to keep up the façade you’ve created When you aren’t being authentic you end up performing what Arlie Hochschild calls “deep emotional labour”, having to go against your values in order to do your work. Over time this creates high levels of distress as you have an internal battle over the lies you’re telling yours and others to keep up the façade. That can wear you down and burn you out. You start to feel like an imposter Imposter syndrome happens when you doubt your competence and feel like your accomplishments are fake and you don’t deserve your success. You fear being exposed as a “fraud” despite evidence of your skills. That’s because when you succeed it doesn’t feel that way as in your mind it wasn’t the real you who succeed. The result is you work even harder to prove to yourself you deserve success, which causes more distress. Instead of being in distress you want to aim for eustress. This is the positive kind of stress that helps you perform at your best. It doesn’t mean you never make mistakes or get frustrated but those feelings don’t have a negative impact on you. 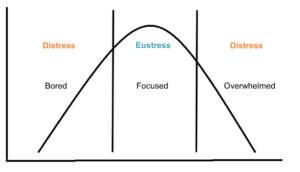 Eustress allows you to get into what psychologists call “the flow”. This is when what you’re doing is challenging but achievable. 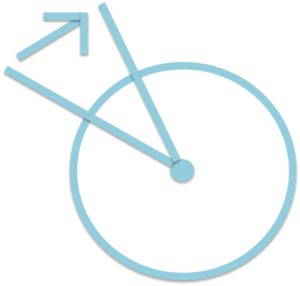 You lose track of time and give whatever you’re doing your full focus. At the end you feel proud of what you’ve achieved. I think that sounds far more rewarding than the alternative. What are my proudest career achievements? What are the career moments I’m ashamed of? When have I felt authentic in my career? When have I felt inauthentic in my career? What are the common themes in my answers? So what is your aim or purpose in life? Here are some ideas to get you thinking. Do any of them resonate with you or do they inspire you to think of your own version. Remember, there are no right or wrong answers. It’s what works for you that matters. It’s one thing to define your dream career but another to actually turn it into reality. Later in the program I’m going to show you a 5 step process to help you get your dream career but that will only work if you first identify and deal with the barriers that are likely to get in your way. Risk aversion You start to see this early on in the show. They tend to produce dishes that are good but not innovative. The hosts push them to take more risks and show their full potential. Some do but others crumble in a sea of tears the minute they’re put under pressure. What they don’t realise is that every career choice comes with risks including playing it safe: you risk getting stuck in a career you like but don’t love. That means you never really give it your best. Sunk costs You can see the contestants thinking about how much time, money and energy they’ve put into getting to where they are now. They think about what a waste it would be to set that aside and try something else. Every career decision comes with an opportunity cost of not pursuing something else but the work you’ve already done can help you in an alternative career. It’s not wasted. What is a waste is staying in a career that isn’t right for you. Plus, a lot of the time a pivot doesn’t have to be huge, it might only be a small shift that creates a big impact on your career satisfaction. Expectations Family and friends will have a set of expectations they believe they must meet. They’re often the good girl or boy who always does what’s expected of them. Their parents often want them to have a better life than them, which generally includes a degree backed, white collar job not getting dirty in a kitchen. They use the show as a way to prove to their parents they can succeed in this career. Most of the time the people around them want to see them happy and will get over the initial shock of going against their wishes if it’s clear they are serious. Stereotypes The show loves to play up the popular stereotypes … age, cultural background, religion, lifestyle, etc. Some contestants hide behind their label but others use it to their advantage. Stereotypes are only true if you believe them. Many of the contestants set out to overturn their stereotype and often succeed. There are so many examples of people who’ve gone against the norm and been successful. The food industry contains many different careers paths so there is something for everyone. Most industries are the same. Self limiting beliefs I’ve had a friend try out for the show and know that the producers look for a mix of personalities not just cooking ability when choosing contestants. As a result they always pick a few people who have great skills but lack the confidence to deal with the pressure. It makes good TV. But those self limiting beliefs end up derailing the contestants because they tell themselves “I can’t do this” or “I’ve never cooked that before”. Once they actually succeed at that round it changes their beliefs about themselves. What all these barriers have in common is that they are perceived barriers. It’s their mindset that needs to shift. This program will help you deal with that but first you need to identify them. So what are your perceived barriers? You may not be able to eliminate these barriers but you can still create a dream career that takes them in account. You just need to be more creative. Don’t let one of these barriers stop you. So do you have any actual barriers? What would a typical day, week or month look like for me? How would that career make me feel? How is it different to what I’m doing now? How is it similar to what I’m doing now? Don’t think about a specific job title or role for now. There are many positions that could be your dream career. For now just think about the big picture. We’ll fill in the details during the rest of the program. 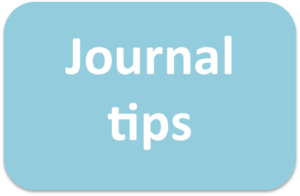 Finally, write an entry in your journal to summarise what you’ve learnt about yourself from this session. What stands out for you as the key points? Now that you are clear on what your dream career looks it’s time to introduce you to the pivot process. These 5 steps are the result of more than 20 years of experience. I’ve found out the hard way how to have meaningful career success so you don’t have to. When I look back at all lessons I’ve learnt and ideas I’ve gathered from observing 1,000s of people, I realised they had a lot in common with my favourite hobby: ballroom dancing. You see as a dancer I regularly need to pivot. That simply means moving my body around a central point. A pivot requires a solid core and good alignment. You then decide on a new direction and take advantage of leverage to create momentum so that a can use a small amount of effort to achieve a big shift. In the next 5 sessions I’m going to take you through each of these steps so you can pivot from where you are now to your dream career using minimum effort to achieve the maximum outcome.